Honorary Civic Reception; The Templemore Golf Club, JB. 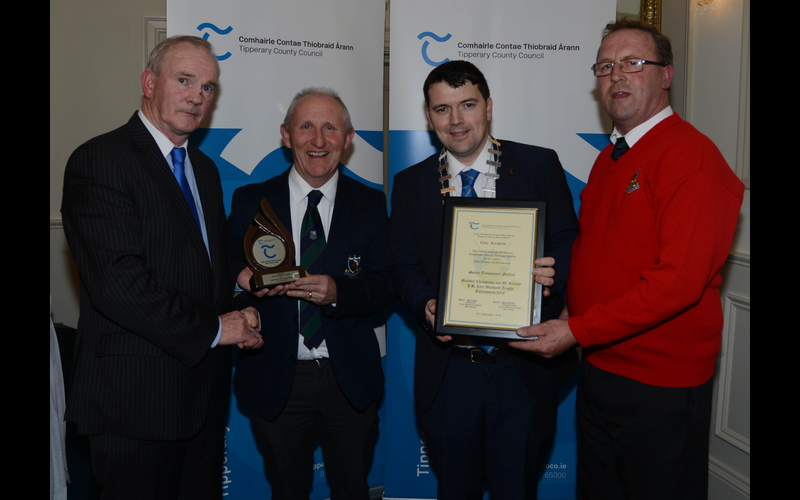 Carr Team, were awarded the highest Honorary achievement award possible by the Tipperary County Council and Members of the Templemore-Thurles Municipal District for their Golf achievement in the National JB. Carr Competition. An Cathaoirleach, Mr. Sean Ryan proposed the motion of acceptance based on the following achievement. 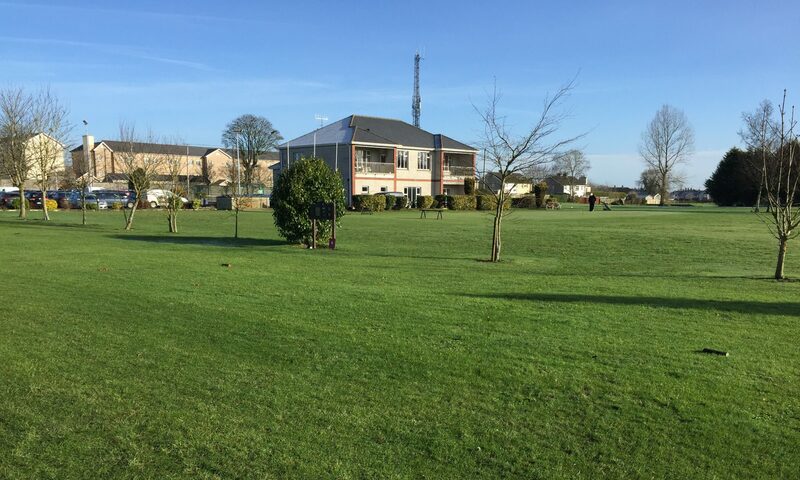 ; “ Templemore Golf Club secured an impressive rating of 3rd best Golf Club in Ireland. The competition was held in Woodenbridge in the picturesque Avoca valley. Woodenbridge was described by the legendary Joe Carr as “Ireland’s Augusta” and “The most scenic golf course in Ireland. 186 Teams competed in this tournament. The final 4 teams placings were, The K.Club, Portunmna, Ballybofey-Stranorlar and Templemore. This great event commenced started on Fri. 31st. of August with the assemble of all teams on the 10th. Tee box in the famous Woodenbridge Golf Course. The teams were presented with their Provincial Flags. Templemore bearing the “Munster Flag”. All were piped across the famous “ Wooden Bridge” to the Club house courtyard where all teams were introduced by the Woodenbridge Lady PresidentSiobhan Saunders. Each team manager called out the team members which was a proud occasion to hear Templemore Team Manager, Liam Leahy call out his team. A wonderful and emotional occasion for all the team their families and supporters. On Saturday the 1st.Sept. the first draw Templemore was competing against the renowned Portumna Golf Club which Templemore took them to the 18th hole, only to concede by one stroke. On Saturday 2nd. Templemore competed for 3rd. Place against another renowned Ballybofey-Stranorlar Golf Club. The Golf was very competitive with the Templemore Team giving their all to secure a victory. Templemore finally won on a playoff on the 19th. Hole with Seamus Bourke and Liam Daly securing a historical victory for the team. A great celebration of victory echoed all over the Avoca Valley from the Templemore Supporters. it was a sight to behold and history was made for Templemore Golf Club. There was wonderful support on all days of the competitions by Templemore Supporters both Ladies and Gents. A united front by all the Templemore Golf Club members was evidence in encouragement for the team. Also great support came up from Mahon Golf Club in Cork in support of this Munster Team. The President of the Golf Union of ireland John Moloughney was also in support of the Templemore Team. On Sunday night the team was presented with their award to the Team Manager Liam Leahy and again a proud occasion when he assembled his team for protocols. All the teams then assembled to a banquet in the great hall of the Golf Club. A unique presentation was made to Tom McGrath for his own personal achievement with a hole in one. This was also acknowledged by the all the teams as an extraordinary win by Tom, again history in the making and putting Templemore on the Golf Map. The night continued with great accolades and to finish off the ceremonial events Templemore Club Captain Tommy Foley, belted out, in the “Crowded Banquet Hall” a fantastic rendition of “Slievenamon” it echoed all over the Avoca Valley. Truly Templemore left a fantastic impression in the golf fraternity of Ireland and Woodenbrige “. Councillor Joe Bourke then Second the Motion and expressed the proud national achievement that this Team brought to Templemore and will be a great motivation for Templemore Golf Club and the Town to be honored with this Jewel in its Crown as a fantastic community amenity to Templemore and the surrounding areas, in particular that it’s the best 9hole Golf Course in the Midlands. Club Captain Tommy Foley expressed his pride in representing this great Golf Club at such a prestigious event having beat the best Golf Clubs in Munster and beating Ballybofey-Stranorlar in the national finals. He expressed that all of these teams, and in particular the KClub invested serious monetary commitment to winning this event and for a small club like Templemore to take on these Golf Giants and win, was a phenomenal achievement. But most of all he congratulated the Team for their outstanding competitive performance and in particular for the “Dignity and Grace” that each team member displayed to all of their competitors and for Templemore Golf Club. The now renowned Team were; Bernie O’Rourke, Liam Daly, Seamus Bourke. Jerry Keegan, Mick Keely, Tom Kenny, Dinny Tuohy, Bertie Keane, Tom McGrath, Ambrose Purcell, Michael Webster, Paddy Bourke and Martin Bohan. Autumn League; The 9Hole Winter League is now in progress for both Ladies and Gents. The entry fee is €20. Re-entry is €2. There will be weekly Prizes, Xmas fare Hampers. The competition will consist of 4 Rounds from 18th. Nov. to 18th. Dec. Round 1; 18th to 25th Nov. Round 2; 25th Nov. to 2nd Dec. Round 3; 2nd Dec. to 9th Dec. Round 4; 9th Dec. to 18th. Dec. . If you have not already entered contact Competition Secretary Liam Leahy on 087-4115773. AGM Reminder; The Men’s AGM will be held on 3rd. Dec. @ 8pm in the Club Lounge. The nominations forms are now available on the notice board for anyone who wants to be on the 2019 committee and can make contributions to the future of your club. All members are requested to attend the AGM. This is the annual opportunity for you the members to participate in future updates, projections and profile of your club. Please make every effort to attend. Ladies Golf; “Ongoing 9hole” competition for Christmas fare. Ladies AGM Reminder ; The proposed date for the AGM this year is Wed 12th of Dec after which all outstanding prizes will be presented. The Seniors; On Thursday 22th. Nov. As usual, there was a great turnout of players, which indicates the continued popularity of this event. The team results were; 1st.Team with 49pts. were; Seamus Bourke, Pascal Whelan, Pat O’Connell. 2nd.Team with 46pts. were; Jerry Keegan, John Brown, Tony O’Toole, Frankie Shortt. 3rd. Team with 45pts. Liam Daly, P.J. Leahy, Tom Kennedy, Sean Lee. Continued Best wishes were expressed to Rody Cawley on his recovery. Next Seniors on Thursday 29th. Nov. Seniors Xmas Party; Dec. 13th. Thursday will be a special Day; In the morning will be the golf as usual at 10am. The AGM will be at 1o’clock followed at 2pm. with Dinner and presentation of all Xmas prizes. A great day in the making. Seniors AGM; Thursday Dec 13th. at 1oClock. Any nominations must be presented to Pat O’Connell on Thursday Dec. 6th. for Chairman, Secretary and Treasurer, Plus 2 committee members. For the continued success of this great event this interested in been active involved are encouraged to put their names forward. New Members for 2019 Reminder; New members are now been accepted for 2019. All current members are encouraged to introduce at least “ONE NEW MEMBER” Lady or Gent, Junior or Student, Seniors Juveniles and Family, Active Retiree’s or any person interested in taking up the sport. It will be a huge advantage to building the club membership and profile. Registrations Forms for new members are now available on-line on our web site, or at the club house or contact Martin Bohan 087 0509278 or any of the committee members. Also, membership payment options can be made through the Golf Club web site link;http://templemoregolfclub.ie/membership/ All will be welcomed. Ideal Xmas Gift Reminder; The Ideal Golf Gift is a membership Voucher. Go online and select the “FEE” tab and then select the “voucher” tab or contact any of the committee for to purchase the ideal Xmas Golf present. New Golf Rules; Pace-of-play support: Reduced time for searching for a lost ball (from five minutes to three); affirmative encouragement of “ready golf” in stroke play; recommending that players take no more than 40 seconds to play a stroke and other changes intended to help with pace of play. Golf Ireland; Golf Ireland geared for the good of the game; Golf Ireland will mean an increase in support from the governing body. The range of services currently provided by the Confederation of Golf in Ireland (CGI) will be delivered under the Participation and Club Support Department of Golf Ireland. These services will be enhanced and expanded, giving clubs greater resources available to help with the things that really matter: membership, governance and competition. Clubs across the island of Ireland are now being asked for their approval so that Golf Ireland can become a reality. On 19 January 2019, each Union will ask their member clubs to vote on the Golf Ireland proposal. 11hole S/f will continue every Sat/Sun. Autumn League now in progress. 3rd. Dec. Men’s AGM @ 8pm in the Club Lounge. 15th. Dec. White Dowling Society 18H S/F. The Pat Delahunty Cup. Date TBC. Spring of 2019 the Captains/Captains in the Algarve.